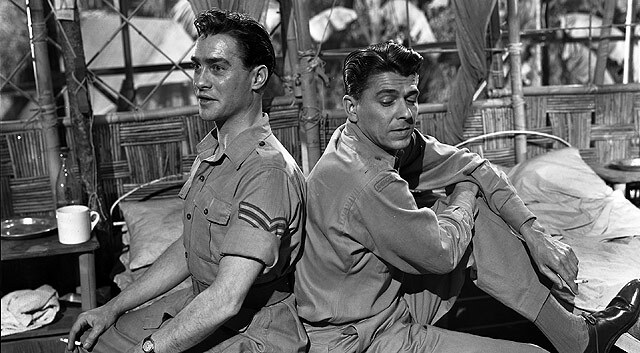 The November choice is the film version of John Patrick's play The Hasty Heart directed by Vincent Sherman in 1949. The Hasty Heart is set at a convalescent hospital in the jungles of Burma at the end of WW2. The few remaining men are awaiting the unraveling of red tape of the healing of injuries before they are to be sent home. Young Scot Corporal Lachlan, known as "Lachey", won't be going home. The doctors prognosis is "no hope" and they ask nurse or, as the Brits say, "Sister" Margaret Parker played by Patricia Neal and the men in her ward to keep the tragic news from the young man and make is last days happy. Most of the men are uncomfortable with being placed in this spot, but agree. The most vocal opponent is Sister Margaret's sweetheart "Yank" played by Ronald Reagan. He is quite eloquent when describing his feelings about the Scots in general and his hidebound grandfather in particular. Lachey does nothing to dispel Yank's misgivings. The young corporal is an embittered loner who trusts no one. It is at Sister Margaret's urging that the pretense is kept up. Very slowly and painfully Lachey opens up to the people around him. He even falls in love with Sister Margaret, which complicates things for everyone. Eventually the feelings of friendship among the group deepen and, ironically, at a time when lies might make things easier they become harder to tell because genuine feelings require honestly. Honesty is also a military order when the Colonel must tell Lachy of his fate and send him home. A heart can break very quickly, but can it heal as easily when precious time is almost gone? The Hasty Heart is an emotional movie and a worthy one. 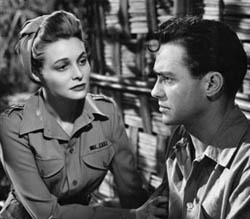 The entire ensemble brings their best to the script with Richard Todd giving an outstanding performance, as evidenced by his Oscar nomination for Best Actor in a Leading Role. Author John Patrick (1905-1995) was born in Kentucky. He began working for radio in the 1920s writing over 1000 comedy scripts and Streamlined Shakespeare for NBC. His early work in Hollywood was a mix of crime dramas such as Mr. Moto Takes a Chance and comedies like the prison send-up Up the River. In 1942 John Patrick began volunteer service for the American Field Service providing medical support for the British Arm serving in Egypt and the India/Burma campaigns. His experience formed the idea for his play The Hasty Heart which had over 200 performances in the 1945 Broadway season. Ranald MacDougall (Mildred Pierce) adapted the screenplay and was nominated by the Writer's Guild of America for Best Written American Drama. Set your recorders because TCM is showing The Hasty Heart on Friday, November 18th at 12:15 am. 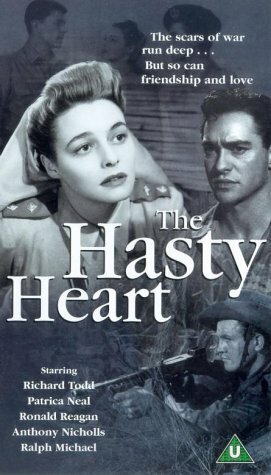 Did you know that Bill Kamberger (bkamberger), long-term contributor to the IMDb Classic Film Board, is directing a production of "The Hasty Heart" this month? If anyone's in the Baltimore area, it will be presented on weekends from Nov. 11 through 20, at the Church of the Good Shepherd in Ruxton, MD. I've seen several of Bill's plays and they're always great. I'm unfamiliar with the movie though. Sounds like it's one I should watch! Caftan Woman, thanks for your wonderful review of THE HASTY HEART! It happened to be one of my dear late mom's favorites, in part because Richard Todd was apparently a relative on the Cherry side of Mom's family tree! (Yes, Cherry was the surname of Mom's side of the family, and yes, Mom and her sister, my late Auntie Joy, were constantly teased about it as young girls! :-)) I'll keep an eye on my TCM "Now Playing" guide! Much obliged for the tip, C.W.! I saw this many years ago, C.W. Once upon a time I had a crush on Richard Todd. He was the epitome of English good looks and intensity....sigh! Lee, that's fascinating. I can well believe that Bill's productions are great. The commitment to bring a play to life is special. Dorian, that's fabulous - one, that it was a favourite of your mom's, and two, that you have Todd genes thanks to the Cherry family. Yes, Yvette, I think it was the Disney Robin Hood movie that started my crush on Todd. Once you've seen "The Hasty Heart" it never leaves you. Never heard of this film - I gotta check it out! You know, DL, it always amazes me when I come across a movie I haven't heart of before. It shouldn't. After all, I know I don't know everything - but, I keep getting amazed. I would love to hear what you think of "The Hasty Heart". Paul, do you still have the record, and can you still play it? I can't part with my "ancient" gems. No The 78 is long gone, I did have it until may be the middle 70's.I still have thousands of Lp's. LPs take up a lot of space, but I'll never part with mine.